Three Virginia teenagers are seriously hurt after an SUV crashed into a tree in Clifton on Tuesday. Two boys and one girl, all students at Robinson Secondary School in Fairfax, were travelling along Fairfax Station Road on Tuesday afternoon. Detectives believe the driver was speeding when the 2005 Jeep careened off the road and struck a tree, Fairfax County police said. Officers responded about 1:55 p.m. and found the Jeep mangled and the passengers injured. 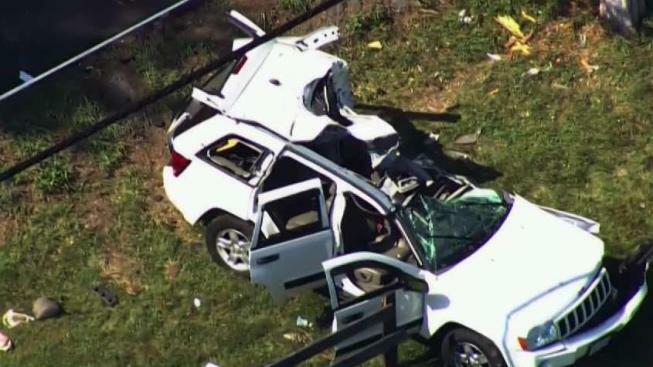 A helicopter rushed two of the teens, who suffered life-threatening injuries to hospitals, police say. An ambulance took the third teen to a hospital. Chopper4 footage shows a large part of the driver's side of the SUV torn away. "It's really a sad situation," said Jeff Floyd, who lives near the scene of the crash.